Jessica and Emily were here for a couple of days during the Christmas break. Here you can see them both working hard to finish an I spy quilt for their cousin Evan. Their cousin, Mitchell has sewed the 4-patches together this summer with me, so today was going to be the day we put together in a quilt as you go style. It's amazing how quick we got the project done when everyone works on it. Well, I was telling Jessica and Emily the story of the Rice Krispies and the mention of Peanut Butter balls made their eyes light up. When we needed a break from sewing, guess what we made. It's so hard to dip peanut butter balls into the warmed chocolate and not get chocolate on your hands. After we all sampled them just to make sure they were good, they get to take these home with them. My niece Stephanie is home for Christmas break from Korea. She brought back some children's chopsticks. To try them out, we had Chinese food for supper. The kids ate just about their whole meal with learner chopsticks. Next time, maybe we'll try real ones. And ta da, we finished the flannel I spy quilt for Evan who will be 3 this spring. There are tons of little boy stuff on there. Iguanas, frogs, bugs, trucks, race cars, monkeys, golf balls, basketballs. I'm not sure who wrote the story of Cinderella, but I'm sure they'd be rolling on the floor laughing if they saw the Duffle Bag theatre troupe's version. My sister and I took my five oldest grandchildren this evening. They laughed so hard through the whole thing. This is where Grace sat for Christmas Dinner. Isn't the place setting pretty. Her place card is placed in the tines of the desert fork. It was fun to have so many around the table. 15 in all. My hubby and I made the main dinner which featured turkey of course. And the cheesecake and shortbread desserts were made by my niece and her hubby, Scott and Michelle. A real team effort this year for a fabulous Christmas Dinner. 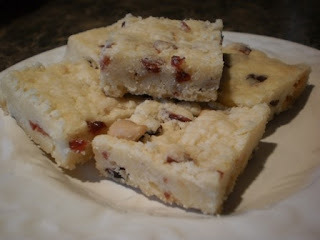 One of the Friday Girls made these White Chocolate Cranberry Shortbread last week when we gathered at her house. This recipe was in the Robin Hood Bake fest flyer that comes out every Christmas. They have the nicest recipes and I always say I'm going to make something from them, but rarely do. But today, I decided I had to make some to serve to company over the holidays. This recipe uses a 9 x 13 pan and it yields 48 shortbreads. 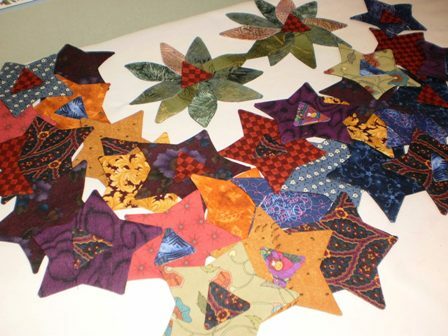 Right after the Christmas break, I'll be starting to sew up the St. Dunstan 2011 raffle quilt. We're doing Bonnie Hunter's Weed Wacker quilt with a different border. It'll be more of a vines and leaves border. So, right now I'm doing quilt math to see how much fabric I'll need. The fabrics I'm using are intended to look like a fall scrappy quilt and I'll cut 3 or 4 of each fabric. I'll have the kit of fabrics ready to start sewing on January 1. It will be done by January 30, so to help keep me focused, I plan to blog about my progress on Saturdays in January. I'm looking for suggestions on a different name for the quilt. The St. Dunstan's quilters don't care for the name Weed Wacker, so they asked me to come up with a nicer name. If you have any suggestions, why not leave me a comment. I'm only stitching the label towards the end of January, so that should leave lots of time to come up with a name. Are Peanut Butter Balls a favorite in your house around Christmas time? They are around here. I made some this afternoon and I'll be serving these along with other favorites over the holidays. Chocolate dipped fat pretzels sprinkled with colored sanding sugar. I think these will make a nice table decoration if nothing else....but I'm sure the kids will eat them up. Tomorrow I make cherry balls and shortbreads. I've decorated my dining room 5-lamp chandelier before, but it's usually for New Years and the decorations are simple streamers. I got the idea from my sister to do something a little more elaborate for Christmas. So, this little pink ballerina was my inspiration. I found 4 other complementary ornaments that were pink and gold and added some small gold bulbs. I love it, and I'm sure the kids will like it too. Have you ever made creme brulee? I found this 5-star recipe on the Food Network here, and made them for a dinner party last evening. They were fabulous. I borrowed a set of 6 flat shallow tea cups and saucers to serve them in. I totally forgot to get a picture of the creme brulee's all bruleed and sitting on the saucers, but they looked pretty fancy. The recipe said it would make 6, but it made 8, so yippee, we have creme brulee for desert again tonight. Do you remember this? I pieced and paper pieced this Jewel as Christmas in July project at the end of July. When I made it, the hot steamy weather had just hit us, and I thought I would just wait until the cool weather got here before I quilted and bound it. 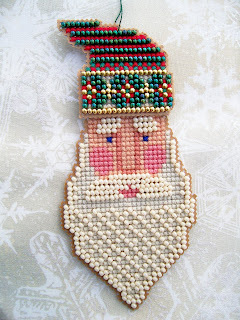 The cool weather has arrived and this weekend I'm uddled up in my sewing room, finishing up some Christmas projects. All along, this Jewel had great movement because of the pieced points. So when it came time to quilt it, I knew I would use motifs that added to the movement of the color. The swirls remind me of the winter wind. 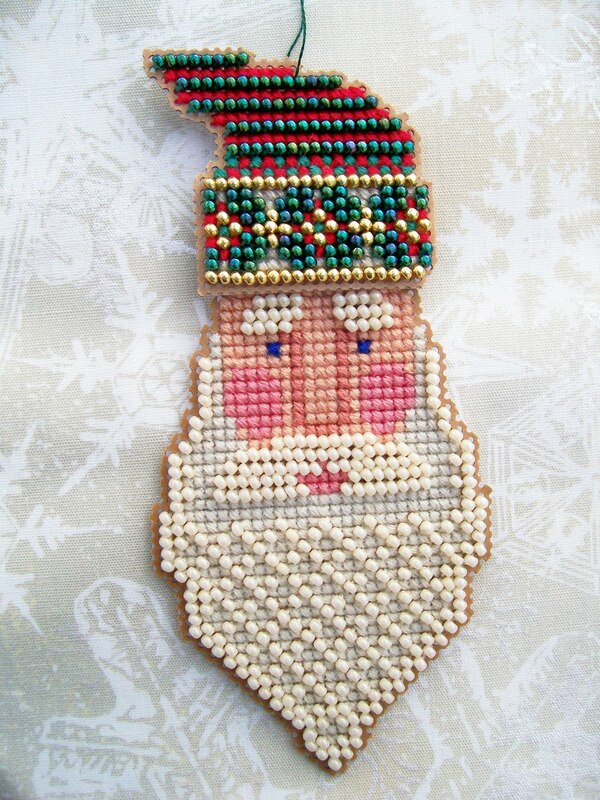 This is a Karen Neary Yuletide Jewel pattern and it can be found here on Karen's site. Nice pattern Karen! I enjoyed binding it because it only had 2 corners to turn. You can't really see how nice this Jewel sparkles, but it fits in perfectly as part of the holiday decor, and I'll be on my coffee table through the holidays. I'm very excited to show you the Nines and Vines quilt top that I've been working on for the past month. This quilt will be hand quilted after Christmas and then be used as a fund-raiser for a local charity. It was a pleasure to make it. Post Note: Want to make one for yourself, the free pattern can be found on McCalls here. I had my little rest from working on my nines and vines, and now I'm back at it. I'm within an hour of finishing the top and I'm so pleased with it. This morning I took an hour and pinned every intersection of the main middle part of the quilt. I know most people hate to pin, but I find I get such a good result when I pin. Even though I'm heavily scheduled with seasonal activities over the next couple of days, I'm positive that by the weekend, I'll be showing you the finished quilt top. Grace, Caitlin and Mitchell came for a visit after school today. Our mission today was to decorate gingerbread. We only had a bit more than two hours, but I think they did a great job, don't you? Grace made two Mario's and some other cookies too. She's a fast worker. Caitlin worked hard to perfect her Mario. Mitchell finished two Mario cookies, but this is the best one. And this is what Grammie did while the kids did theirs. These are for our Christmas tree. Aurora was here over the weekend for a visit. So, we had a couple of important things on our agenda. First was to make a custom photo album of pictures of all kinds of people that Aurora knows and loves. And the second thing was to make gingerbread cookies and decorating them. This would be Aurora's first time. I knew I would need the help of somebody who was very experienced at many kid things. So Grace agreed to come over yesterday and she would stay and help out with Aurora. So, this is what cookie dough tastes like. A loves it! With a little help, Aurora is going to be a natural at decorating cookies, don't you think! I got a chance to use my newly re-arranged sewing room today. It functions very well. I did find my new little table shakes a bit when I'm sewing, so I'll reserve the pedal to the metal sewing for the Juki which is sitting on my more substantial Ikea table. I had started sewing this Bow Tucks Bag early yesterday morning before I started organizing my sewing tables. I didn't get back to it until this morning. It was fun to make, and what a cute pattern and a quick finish. I call it a winter bag because the bottom fabric has snowflakes and is quoting the "Naughty Kittens lost your mittens" poem. I've decided to make another Bow Tucks Bag and I'll be shopping my stash to pick different colors for the next one. Next on my list of things to do is to machine quilt my three small Christmas in July projects. Stay tuned. I'm still sorting and organizing, but the new table fits like a glove. And this is what it looks like after. I moved my threads to the far side so I can now see my bulletin board again. And there's lots of room on either side of both machines to work. Ahh, this Sew Much More table is going to give me so much more comfort when sewing.. It's still in the box, but I'm really excited to have this new table. Last year, when I got my new Juki, I re-arranged my sewing room so that I would have my two main sewing machines set up all the time. It works, sorta.... Well, maybe it doesn't work. When I sew on my Pfaff, I have to sit spread eagle because there's a bank of drawers right under the sewing machine. Not so ergonomically correct. Tomorrow, I'm taking everything off my long table, and reverting back to a shorter table, and this new Sew Much More table that I got from Joann Fabrics. My knees should fit under it comfortably. Watch for the before and after pictures tomorrow. Here is another sample of Wonderfil thread. This one is done up with Wonderfil Tutti 50 wt. Like the 12wt, this is Egyptian cotton thread. I love love love this thread. It's the perfect weight for me for machine quilting and I think this is my new favorite thread. Again, I got this at Country Crafts and Curains quilt shop in Fredericton and it was hot off the press. She just got them in the day before. Yummy colors that so perfectly with Bali's and batiks. To test I first just free motion stitched over my previous sample of the Wonderfil 12wt thread (the heavier thread in the picture). Within minutes I knew I really enjoyed sewing with the Tutti 50wt, so I made up this 18" square plain sandwich of cottons and batting and drew a gridded circle.. and started to free motion. Took about an hour. Yep, I do love this thread. I seem to be into the coffee colors lately, so the color I chose was a variegated browns and it shows up very nice on this off white fabric. I think the color is called Box Turtle. I ran my Juki hard when I was machine quilting to see if the thread would break. It didn't! I am impressed. Later this week, I'll use my new spool of Wonderfil Tutti 50wt to quilt one of my Christmas in July projects. Stay tuned. The Brother NX-2000 - My final comments. Well, I'm sorry to see the Brother NX-2000 go home. I guess all good things come to an end. I thought maybe an email might come that says, ahh, Gail...just keep the NX for the year and we'll get it back when-ever.....but sadly, I don't think that's the case. I really enjoyed working on this evaluation. Some time ago, I had earmarked the month of November to work on the Nines and Vines queen size quilt that will ultimately be used as a major fundraiser for the Stan Cassidy Foundation (Rehab Center). So when I was contacted by a representative of Brother, I thought what a perfect opportunity to evaluate a new machine in a way that was exactly how I would use it day to day. And I did just that. It turns out that I'm a couple of days short of finishing the Nines and Vines, but the major components are done and I certainly have hours and hours of sewing straight stitch, free motion quilting, and applique. I think all this gives me an excellent feel for how this machine works. As a quilter/sewer I tend to do 99% of the same stitches. That would be straight stitch, free-motion/machine quilting work and applique. The straight stitch, while not usually notable, I was impressed that this machine came with a single stitch throat plate. I used it. The hours of straight stitch that I did were flawless. I was also impressed with the thread cutter. I had one on my sewing machine, and it never worked like it should.. Also with the straight stitch, I used the specialty twin needle that came with the machine. It's been a long time since I used the twin needle and I loved how it stitched perfectly and the back side of the twin stitch seam was thin and tidy. On the topic of straight stitch, I am used to an integrated walking foot and I use this when I do all my quarter inch seams. While this machine does come with a traditional walking foot, I found that I rather stitch with the quarter inch foot rather than the walking foot and sacrifice the even feed capability. I love that there was good light shining directly below the needle. That's a problem on my machines, so it was a delight to have light where I needed it. The accessory extension table made for a nice large work area. A must for quilters now a days... I left it on the whole time I had it for testing. Now I need one for my other machine :). I liked how easy this machine was to thread. It's marked with numbers, so it's "Thread by Number". The needle threader worked every time. My sight isn't what it used to be, so the threader is welcome. The spring action of the threader does give a big clunk when it threads, but it threads every time which is good. I had trouble using my pre-would bobbins. I tried two different kinds without success, but it's not the first time I've had trouble with pre-wounds. I guess it's trial and error with every machine. The applique worked wonderful for me. I used Sulky invisible thread and adjusted the tension so that the bobbin thread didn't show. I stitched applique for about 12 hours of stitching my vines, so I think I'm an expert on the applique on the Brother. Thank goodness for the pivot function. It's a life-saver because did you know that 5 pointed stars have 10 sides! Pivoting made this job very easy. There are many stitches available to do applique and I'm sure that a quilter will use many of these stitches for various works of art. I tested 3 and chose my favorite to use with the invisible thread. I really enjoyed having this Brother NX-2000 and would feel comfortable recommending this machine to fellow quilters and sewers. Have you ever tried 12 wt thread. This is from the Wonderfil Fruitti collection. It's quite thick, but I was intrigued when I saw this at Country Curtains and Crafts yesterday. It's a machine quilting thread, and at first, I thought this would never go through the self threading mechanism on the Brother sewing machine I was evaluating, but it did with no problem at all. I put a simple sandwich together to try this heavy thread. It definitely makes a statement of its own. I would use this if I was doing a quick project with big all over quilting. It definitely shows beautifully. You should see the colors.... just to die for... There is a lighter weight coming into the shop this week, and I'm really anxious to try it. By the way, are you going to Dianne and Holly's annual Christmas sale at the Heritage Center in Marysville? It's being held tomorrow, Friday from 1pm - 8pm. I hear there's going to be a great clear out section as well as great prices on Bali's and many other items. See you there. Whew, the pressure is off. My vine borders are done. While I still have a couple of short days work to put the Nines and Vines together, I really wanted to do the vine borders on the Brother while I still have it. So that means I have the 9 patches done, the borders done so I'll assemble after taking a little break. Some of you have asked about where to find this free bonus pattern. It can be found on the McCalls Quilting website here. I'm working on my borders. I do have the vine done on each of the 4 borders, and I'm now adding flowers and leaves on the first border. What was I thinking, thinking that I would have these borders done by the end weekend. It's a ton of work to place and stitch around each star. I do really like doing applique on the Brother NX2000. I like it because the applique stitch that I'm using takes a 90 degree stitch to the left and then back. It's not a zig over then back kind of stitch. It's handling my invisible sulky thread like a charm. The few stars that I have completed are so nice. The time is counting down. My evaluation time for this Brother is almost up. So my more realistic goal is to get the rest of the applique done in the next few days. Stay tuned. I'm testing the size of the vine I'll use on the borders of the Nines and Vines. And I'm also testing the stitching of the applique with invisible thread and deciding on which of the many specialty stitches I'll use on the Brother. I inserted the bias bar, rotated a bit so the seam is facing upward. Then I press it down. Removed the bias bar, and pressed in a curve. Now I'm ready to applique! Oops, not quite yet. Of the many styles of applique stitches, I had to chose which one I'd use. I tested a few, and chose this fine stitch and practiced with white thread. It's so hard to see the invisible thread :). Stitching down the vine with the invisible gave me good information. I adjusted the tension so the white bobbin thread didn't poke up through. I set the pivot function on, and started sewing. Easy Peasy!! With my sample done, and all the settings locked in the Brother's memory, I'm ready to stitch - tomorrow that is. I'm loving the border work on the Nines and Vines. I have the stars and leaves prepared and I'm laying the vines on the border now. The borders should be completed pretty quick ... by the end of the weekend I hope. To applique the stars and leaves, I plan on using Sulky poly invisible thread and use the no-show applique stitch on the Brother NX2000. I've done a few extra stars so that I can do some testing. I'll show you my test pieces tomorrow. Meanwhile I had been meaning to make a little gift for our local travel agent. She's great at searching out great options for our travel, and looking for deals. We use her services quite a bit even from afar. 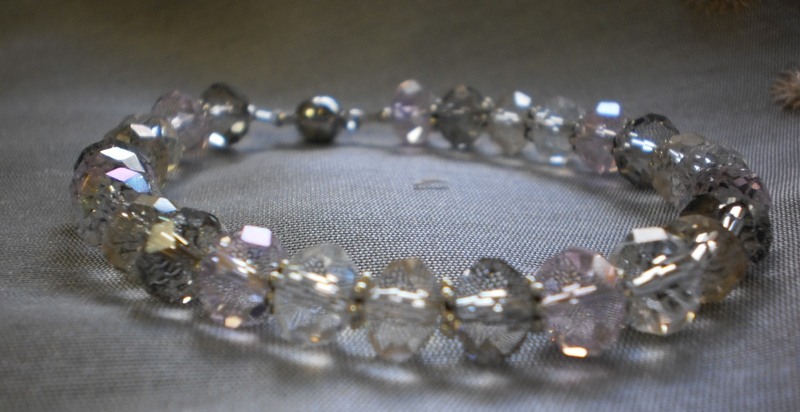 She ordered some special travel brochures for us and because I was planning to pick them up today after the Friday girls coffee break, early this morning I made this crystal bracelet for her. She really liked it and was surprised when I gave it to her. 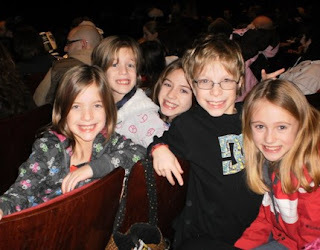 Why not drop by my friend Linda H.'s blog. She's having a give-away to celebrate 300 posts. Congratulations Linda, and my my, doesn't time fly quickly!